I spent the morning doing tweeks to the website, I actually got quite a bit done. Can you spot the changes? That'll be it for the day though our friend Paul Smith is visiting so we're having a few beers, talking about art, collabortaion and the imminent collapse of civilisation as we know it. Check out Paul's website, he makes some beautiful sculptures. Thanks for the link to Paul’s website, Rob. I saw some of Paul’s sculptures at the 2008 Potfest in the Park (couldn’t make the 2009 show), and thought they were lovely. 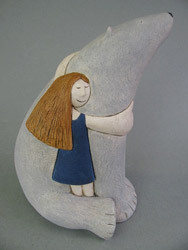 I wasn’t the only one: my daughters took great delight in giving some of the larger sculptures hugs of their own. I think Paul has exhibited closer to my home near Cambridge as well — I’m sure I saw some of his work in the window of Cambridge Contemporary Art not that long ago.